Allow having a partially implemented Process Guide flow, where the customer will be able to decide if the scenarios the current implementation supports are sufficient to transition over, and get to experience the better performance, and be able to rely on the new flow with any tweaks and customizations necessary. There is one small BUT, however. For any flows that were implemented before version 8.1.3, where the customer is already live and has multiple mobile device menu items created that are relying on Process Guide, those will stop working, with an error "Invalid Work Execute Mode". The very simple mitigation for the issue is to simply go and enable the check-box to use process guide on the mobile device menu item. We expect that the impact of this should be very minimal, as there aren't that many Process Guide based flows live on 8.1.2 or below. But if you do encounter this, please use the mitigation above. Currently many companies resort to manually choosing which shipments need to be added to a wave we are about to process, which is slow and error prone, as the user needs to check up on each of the shipments, understand where it is headed, what types of items are on it, which mode of delivery is used, etc. 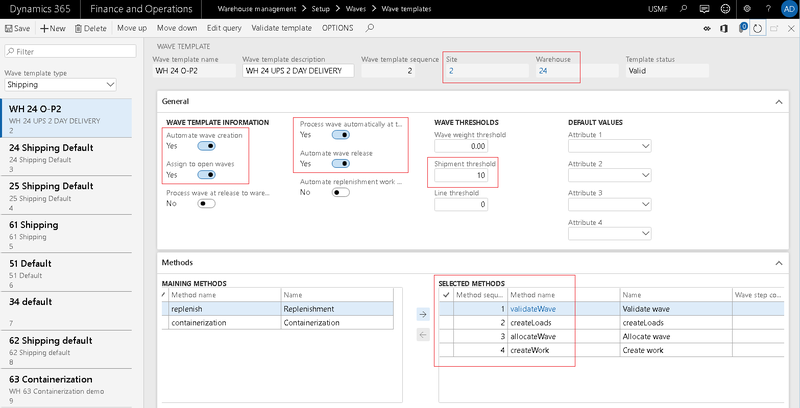 Today I would like to show a demo example of how to configure wave templates, as to allow a more optimal distribution of orders, based on, say, delivery mode, or some other cut-off criteria. Automatically, without any user interaction. Imagine that I would like to accumulate and then process all 2-day shipping orders at once, every second day, so I have the picking done before 4 pm that day when the UPS (or other 3PL) truck arrives to pick them up. For these orders I want to pick as fast as possible, and the inventory is typically already at the locations and does not need special packaging, so I will not include replenishment and containerization steps into it, and will configure my work template to take the goods straight to the bay doors. I would also like to limit the number of shipments on each of the waves to 10, so as to not overwhelm my workers. Instead, I'll release another wave later in the day if necessary. Generally, I'd like the wave to be processed automatically as soon as 10 shipments have accumulated, but throughout the day my Wave planner might process another wave, depending on the situation. Note. No need to add any filters on Site or Warehouse, as these will be automatically added. I want to only look at shipments for Sales orders, and only those that have a 2 DAY shipping mode of delivery. Pretty simple. If I wanted, I could make this much more granular, by adding additional table joins and adding filters on them. Now let's create a couple sales orders, set the Mode of delivery correctly, reserve the inventory and release the orders to the warehouse. Mode field on the sales order, if the Mode of delivery is not filled in. Mode set on the Carrier associated with the specified Mode of delivery. I only added one simple line for the example, on both sales orders. When we release the first order to the warehouse, we will create a new shipment, which will have the correct Mode of delivery. 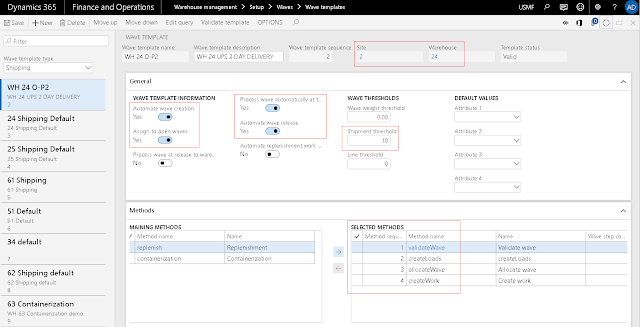 We will then proceed to search for a wave template that matches it, based on Site, Warehouse, as well as the defined query. Our newly created wave template should succeed here. We will not however be able to find an existing Wave in status Created, that would match the Site and Warehouse for the shipment that is also using the same wave template. Which means we will go and create a new Wave. When we release the second order to the warehouse though, we will find the wave created above, and because the conditions for adding to the same wave are met, and the wave template has Assign to open waves marked as Yes, we will add the shipment to the found wave instead of creating a new one. 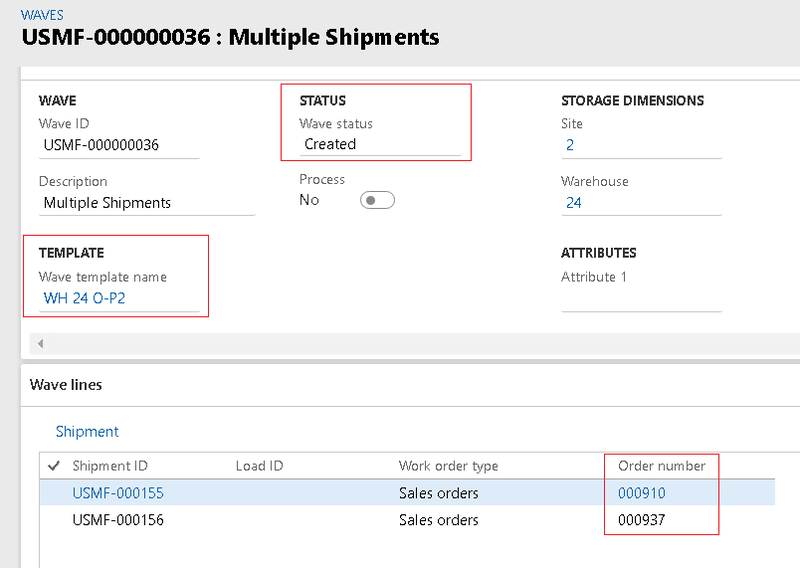 Q: What if there is more than one wave in status Created, that was created based on the "right" wave template, and is for the same Site and Warehouse as the newly created shipment? Which wave will the shipment get assigned to? A: The first of the waves that matches all of the criteria which also does not exceed the thresholds. 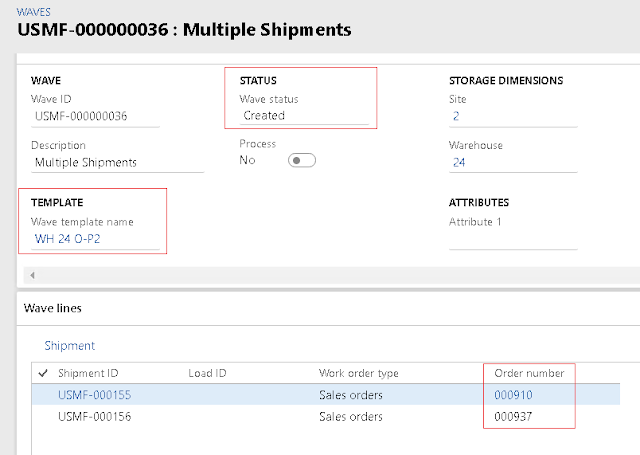 Q: Can I use fields directly from the sales order in the wave template query? As you can see, setting up a wave template that will group multiple shipments and create a new wave if necessary is relatively simple - you just need to get a few of the specifics correct in the setup, and then everything will work like a charm. In one of the next posts we will combine this configuration with automatic release of sales orders, to achieve full automation of sales order release process, where no user interaction is necessary at all past the sales order creation and confirmation step. [Development Tutorial] Tired of WHSWorkExecuteDisplay*? ProcessGuide to the rescue! 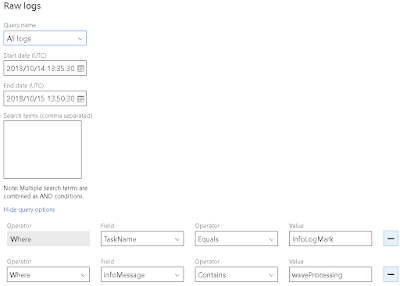 If you have ever tried extending the warehouse mobile flows in Dynamics 365 Finance and Operations, you know the code is very complex and extremely difficult to make sense of and modify without introducing regressions in unpredictable scenarios. This was of course on our mind as well for some time, which is now I am pleased to announce the release of a new framework for implementing such flows, called ProcessGuide framework. We will incrementally start converting the existing flows, and you should do the same with yours. Give it a try and let us know if you have any feedback by leaving a comment here or reaching out directly! Having difficulty understanding your own business data is probably not something you would expect to happen to you, but I know many people, including many 10+ AX experts who have a difficult time following the information about item availability when it comes to warehouse related items. In this blog post, I will try to walk you through a specific example, line by line, column by column. Note I am assuming that everyone is familiar with the general way we show on-hand information, specifically that you can summarize it by a different set of dimensions, viewing it aggregated by warehouse, location, or any other combination of dimensions. 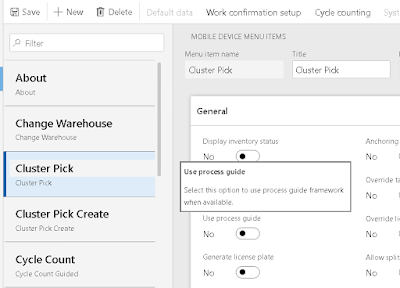 The problems start when you need to account for the reservation hierarchy of the warehouse enabled item, and displaying how much is available at the different reservation hierarchy levels. If we look at the Physical Inventory column, the on-hand there is always at the lowest dimension level – meaning we only see values for rows where you have all of the dimensions specified, down to the License plate level. Work reservation are at the location level. That’s what we have in row 5, where 2 work orders each reserve 10 units, and those units are to be picked exactly from location FL-001, but we do not care which license plate they will be taken from. (DARK BLUE). Same for the 4th line, 10 there and all of it is available. i. It is due to the reservation being on a higher level. The reservation is done at the location level, so when calculating available, it accounts for other license plates in this location as well, LP 000USMF-000..55 has 5 on it. ii. Another way to think of it – how many items can I take away from this License plate, so my existing reservations are still respected. The answer is – 75, because you’d have 15 left on this LP and 5 more on the other LP within the same location. The warehouse-level reservation is also still respected, because we have enough in other locations. On FL-001, 000USMF-00..55, we have 5 available. That’s what is physically there, and because we have enough in the other LP, all of this is available for taking for another purpose. The total quantity available at the location level matches what I described above, and equals 75, as it has 95 physically on it on multiple LPs, and 20 is reserved for work. On the warehouse level, we have 205 physically, and we need 30 for sales orders, so 175 is available to be reserved for other purposes. As you can see, that’s not a direct sum-up of the other rows. Same as the available quantity on FL-001 was not a sum of what is available at each LP. The calculation logic is the same here. How much telemetry are we collecting? A lot, like, really a lot! That includes kernel level information, like an online user session requesting web access to a particular AOS to perform business operations through the web UI, a web service request to handle a mobile device operation, an OData request for exporting or importing data, exceptions and other infolog messages displayed to the user, etc. 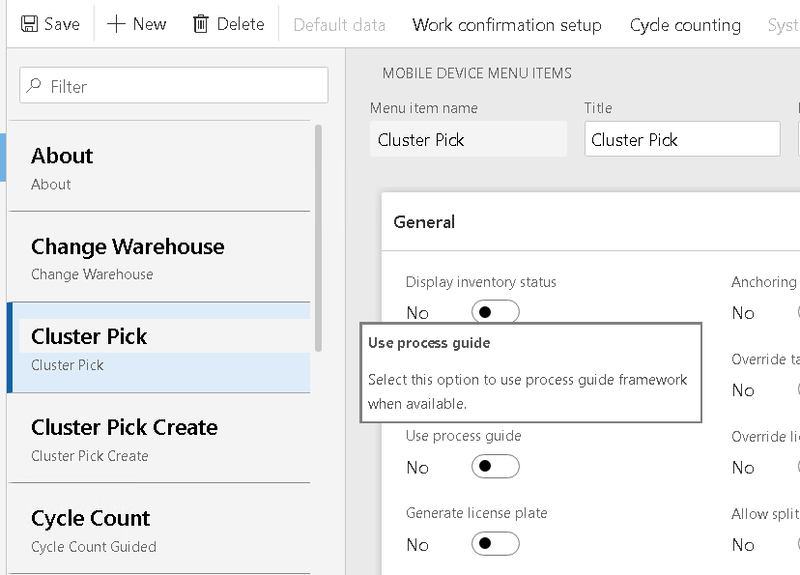 It also includes specific application-level information, like details about each step during an inventory update, or information about the different wave processing steps, the specific flow happening on the warehouse mobile device, etc. And we keep adding to it to have more and more granular information about what exactly is happening in the system at any particular point in time. How can I access all this telemetry? You can find it under "View Raw Logs" under Environment Monitoring in LCS. You can then use the different search options described above to query out the specific events you are interested in. What about Warehouse - specific telemetry, say, Wave processing? Depending on the version of the product you are running, it differs slightly. Note The above query options is a preview feature, so is most probably not visible to you yet. If you then wanted to filter on a specific wave, for example, you could add that to the search criteria as well. Note that due to compliance, all of the information is not exposed directly, but rather RecIds are used. So you'd need to retrieve the RecId of the wave you wanted to investigate. infoMessage would contain information about the actual wave step performed, as well as specific details about the step, like how many load lines were processed, how long it took, etc. You could search for WHSPerformanceTaskStart/Stop directly in the TaskName instead of as part of infoMessage. The rest still applies. What about mobile device telemetry - do we capture that? Just search for TaskName == WhsUserActivityEvent. This event, if you search for it in code, is invoked at the very end of processing the user input from the mobile app. You can correlate these events with those of TaskName == RequestContext, where the url of the request contains "/api/services/WHSMobileAppServices/WHSMobileAppService/getNextFormHandHeld" - this is the actual web service call as it arrives at the AOS, so the point in time when the AOS starts handling the mobile app flow step. Everything that happens in between with the same ActivityID is part of the flow, whether that is slow queries, error messages or other relevant events. I don't see these events - what should I do? We have back-ported a lot of the telemetry through hotfixes. Search for it on LCS for your specific release. But I would also like to take this opportunity and move up to the latest release. There is soo much goodness in there! Should partners be adding telemetry? If you are a client, I suggest that you start insisting your partners adds telemetry with any new code the push into production. If you are a partner, I suggest you start adding it asap - you'll save yourself a lot of time going forward, if the customer has an issue with your code. Since you cannot just debug in production any longer, you'll need to rely much more on alternative ways of telling you what exactly happened. Telemetry is the solution. Where do we start? Do we have some examples? We are working on the guidance for this and will share this out very soon. Yes, all of the application telemetry is added directly as part of the application code, so should not be too difficult to find. I suggest that you rely on the same event "InfoLogMark" as shown below as well. Consider adding a using statement to reduce the invocation. What else should be captured out of the box that is critical for you?